MP3 compression of digital audio files made music more portable. First developed almost three decades ago, the MP3 format made large digital audio files relatively small and easy to pass across an internet that was largely accessed via a very slow (by today’s standards) phone dial-up connection. Now the companies behind the file compression format, Technicolor and Fraunhofer IIS, have decided to end their support for the licensing program for MP3. The last patent for the tech format is due to expire at the end of the year. So the MP3 is dead. Again. Or is it? MP3 is a form of codec, a way of compressing (co) and decompressing (dec) the data in audio files. The organisation responsible for defining the standards for audio and video compression and decompression is the Moving Picture Experts Group (MPEG), a working group of several authorities. So MP3 is just short for MPEG-1, Audio Layer 3. Full resolution digital audio files are relatively large, around 10MB per minute of stereo, CD-quality sound. Today, streaming 10MB/minute might seem trivial but in the early days of digitally transferred data it was a lot. MP3s were initially developed with the goal of a 12:1 compression ratio achieving acceptable sound quality. A 60MB song could therefore be compressed into a 5MB file. Other compression ratios can be used, with higher ratios yielding more obvious sonic artefacts (unwanted sounds) and lower ratios resulting in higher file sizes. Hear the quality (or not) of MP3 compression at different bit rates. A “lossy” compression codec works on the theory that, as the human ear is already discarding a lot of information in the perception of sound, you might as well simply not encode this redundant information. The term lossy comes from the fact that this data is lost, discarded and gone forever. MP3 and rivals AAC (Advanced Audio Coding) and WMA (Windows Media Audio) are all lossy formats. The audio that gets edited out in MP3 compression, in this case from Suzanne Vega’s version of Tom’s Diner. Conversely, lossless compression reduces file sizes, but does not reduce quality. Something like a compressed zip file is an example of lossless compression. Uncompressed files are a straight 1:1 transfer of the digital file. Developed in the late 1980s and standardised in the early 1990s, MP3 was first pronounced dead in 1995 and nearly abandoned as a technology. It was deemed commercially unsuccessful despite heavy investment from the Fraunhofer institute and a decade’s development by the project’s leader Karlheinz Brandenburg. It was the victim of a format war, led by Dutch manufacturer Philips. Fraunhofer’s MP3 was consistently overlooked in the early 1990s by the MPEG standards group in favour of Philips’ MP2. The MP3 format only found early commercial success in the sports broadcast market, with the compressed digital audio saving broadcasters thousands in satellite transmission costs. So deeply unpopular was MP3 in commercial music applications that the developers effectively gave it away for free. As a result, the format was close to being abandoned by its developers again towards the end 1996, in favour of the AAC format still patented and supported today. The AAC format was developed initially by the same team behind the MP3, in part as a way to circumnavigate technical limitations imposed by Phillips on the MPEG-1 standard. 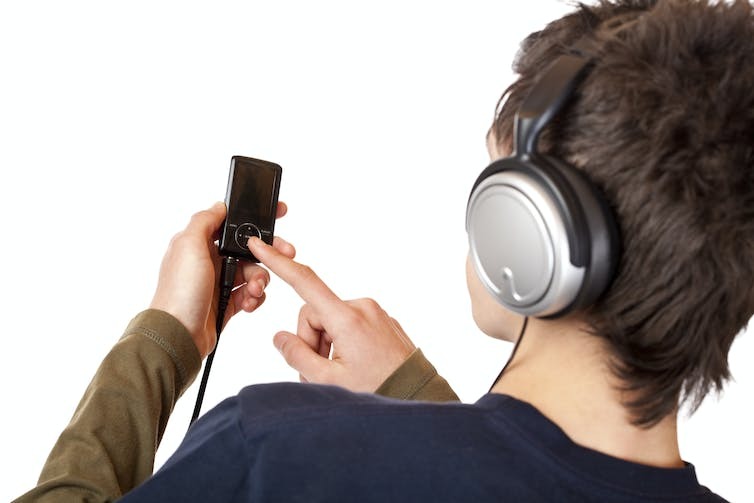 AAC generally performs better than MP3 at higher compression ratios, and the patent does not require a user to obtain a license to stream or distribute AAC encoded audio. Listen carefully to the cymbals. It was only the proliferation of filesharing internet sites, built around the distribution of pirated content, that revived interest in the MP3, first as isolated “warez” sites, and then as peer-to-peer networks such as Napster. Stephen Witt’s 2015 book How Music Got Free (a source for much of this history) says that the first time the term MP3 was used by mainstream press was May 1997, with a USA Today article detailing how college students were uploading bootlegged albums onto university servers via file sharing sites. By this stage, the first time most people had even heard of the MP3 format, the horse had already bolted, and the music industry would never be the same again. The first portable MP3 player, the MPMan, debuted less than a year later, and Apple’s move into the market in 2001, through the release of iTunes and the iPod, cemented the ubiquity of both compact music players and compressed digital formats. Early MP3s didn’t sound great and were generally disliked by audiophiles and record producers alike. But they allowed consumers to stockpile music to an extent that had not been possible before, heralding a new relationship between digital information and ownership. A market model based on scarcity had been turned on its head. While copying music had been around for decades, each copy was physically coupled to the medium – a vinyl record or magnetic tape cassette, for instance. The rise of peer-to-peer file sharing networks, most famously Napster, meant that now anyone with a computer and internet connection could access another person’s entire music collection. A single file could by copied by thousands, all at the same time. This changed listening patterns: instead of buying perhaps one album per month (depending on what you could afford), and then listening to it several times, music fans could constantly scour the internet for new music. Some would even stockpile music that they would never even listen to. Today, playing MP3 files is increasingly being superseded by the ubiquity of streaming services. With fast and cheap access to mobile internet, services such as Spotify, Apple Music, Google Play and others now all offer extensive music libraries that can be accessed for a subscription fee. Just one of several online music options. Presciently, Brandenburg’s mentor, Dieter Sietzer, had suggested as early as 1982 that the most effective delivery of digital audio was through streaming, as a way to make use of Germany’s new digital telephone lines. His patent was refused. If it was the increase in portable MP3 players and the proliferation of pirated content that cemented the role of the MP3 in youth culture, it is the rise of streaming services that define current habits. Despite Fraunhofer’s termination of its licensing program for the MP3 format, the MP3 file will continue to live on, unsupported by the developers, but now unrestricted by patents or licences. While better codecs now exist for compressing digital music files, it’s interesting to note the revival of the old format of vinyl. Today, events such as Classic Album Sundays are emerging as an attempt to reclaim focused listening experiences through the use of analogue technologies that have been nominally obsolete since the late 1980s. I believe it very unlikely that similar listening parties will develop in an attempt to celebrate the early MP3. This is the first in a series of sermons by Albert N. Martin on Scriptural texts that epitomise the Gospel. This is a very good and simple sermon declaring the Gospel from John 14:6. Pastor Martin fairly clearly expounds the practical sense and meaning of Jesus being the Way, the Truth and the Life exclusively.